Saint Peter illustriously occupied the throne of Alexandria for twelve years, and, as Eusebius says, “was a divine example of a bishop on account of the excellence of his life and his study of the Sacred Scriptures” (see Eusebius, Eccl. Hist., Book VII, 3 2; Book VIII 11, 13; and Book IX, 6). He excommunicated Arius for his sympathy with the Meletian schism. Melitius, Bishop of Lycopolos, rejected the idea that the lapsed could return to the Church and thus created a schismatic group. When Arius learned that Saint Peter had been imprisoned, he sent many priests and deacons to him, asking that he receive him back into the communion of the Church before his martyrdom (he did this in the hope of becoming Bishop of Alexandria). 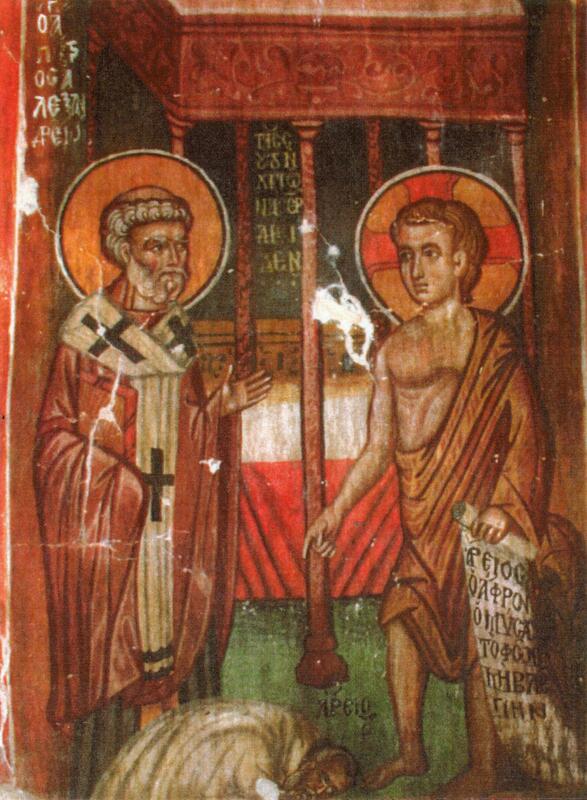 When the ambassadors of Arius, among whom were Achilles and Alexander the presbyters, who had not, like Saint Peter, perceived the ruin he would engender, were astonished at the vehemence with which Saint Peter refused to receive Arius again, he revealed to them a dread vision he had seen. In the vision the Master Christ had appeared to him as an adolescent of 12 years of age wearing a white garment torn from head to foot which He held with His hands to His breast to cover His nakedness. When Saint Peter asked the Lord who rent His garment, the Lord answered that it was Arius, and that he must not be received back into communion because he rent and tore asunder His people in the Church. The Lord also told Peter to bless Achilles as his successor and Alexander as Achilles’ successor so as to prevent Arius from coming to the episcopal throne of Alexandria. Eventually, the motif of the torn garment became a metaphor for schisms and for the Arian misinterpretation of the Trinity. The holy hieromartyr Peter was beheaded during the reign of Maximinus in the year 312; he is called the “Seal of the Martyrs,” because he was the last Bishop of Alexandria to suffer martyrdom under the pagan Emperors. His successors to the throne of Alexandria, Saints Alexander and Athanasius the Great, brought to final victory the battle against Arius’ heresy and Meletius’ schism which Saint Peter had begun. Be mindful of our weakness, almighty God, and because the burden of our sins weighs heavily upon us, may the glorious intercession of blessed Peter, Your Martyr and Bishop, sustain us. Through Jesus Christ our Lord, Who liveth and reigneth with Thee in the unity of the Holy Ghost, one God Forever and ever. R.Amen. O God, whose mercy is beyond all telling, and who didst give the blessed King Edmund strength to overcome his enemy by dying for Thy sake, in Thy loving kindness grant that by his intercession we, Thy servants, may have grace to conquer and extinguish in ourselves the promptings of our ancient foe. From all perils of soul and body defend us, O Lord, we beseech thee, and by the intercession of blessed and glorious ever Virgin Mary, Mother of God, of blessed Joseph, of thy blessed apostles Peter and Paul, and of blessed N. and all the Saints, graciously grant us safety and peace that all adversities and errors being overcome, thy Church may serve thee in security and freedom..
O God, the shepherd and ruler of all the faithful, graciously look upon thy servant Francis, who thou hast willed to be chief pastor of thy Church; grant him we beseech thee, by word and example to profit those over whom he rules, that together with the flock entrusted to him, he may attain to life everlasting. Through Jesus Christ, thy Son our Lord, Who liveth and reigneth with thee, in the unity of the Holy Ghost, ever one God, world without end. O Lord, graciously accept, through the merits of Your blessed Martyr and Bishop, Peter, the sacrificial gifts dedicated to You, and grant that they may prove to be for us a lasting help.Through our Lord Jesus Christ Thy Son our Lord, Who liveth and reigneth with Thee in the unity of the Holy Ghost, one God Forever and ever. R. Amen. Look graciously, we pray Thee, almighty God, upon this redeeming sacrifice, and at the intercession of Thy blessed martyr King Edmund, accept it as a peace-offering on behalf of Thy servants here. Look down favorably, O Lord, we beseech thee, upon the gifts we have offered: and let thy constant protection direct thy servant Francis, whom tho hast chosebn to be the chief pastor of the Church. Through Jesus Christ, thy Son our Lord, Who liveth and reigneth with thee, in the unity of the Holy Ghost, ever one God, world without end. R. Amen. Refreshed by partaking of the sacred gift, we beseech You, O Lord our God, that we may enjoy the benefits of the rite we perform through the intercession of blessed Peter, Your Martyr and Bishop. May the tribute of our homage be pleasing to Thee, almighty God; and, at the intercession of Thy blessed martyr King Edmund, may this sacrament which we have taken help us to lay hold of the rewards of everlasting life. Let the reception of this divine Sacrament protect us, O Lord, we beseech theee: and may thy servant Francis, whom thou has chosen as the chief pastor of thy Church, along with the flock committed to him derive always from it protection and help. Through Jesus Christ, thy Son our Lord, Who liveth and reigneth with thee, in the unity of the Holy Ghost, ever one God, world without end. R. Amen.